Alec worked in public libraries for many years, specialising in work with children and young people, and is still very active in the children’s book world today. He’s particularly pleased to support public library events, either with visiting school classes or as part of holiday programmes. Alec’s unique experience with children’s books makes him an ideal guest: as well as traditional stories, he can bring picture books alive, entertain with poetry, and perform dramatic extracts from modern fiction too! He’ll work with any age, from Early Years groups to Secondary students; audiences can be single classes, or two or more classes together. Sessions range from 30 to 50 minutes depending on age. Use Alec in two or three libraries in one day, to maximise the visit! Visits to public libraries can be combined with visits to nearby schools, sharing travel costs. 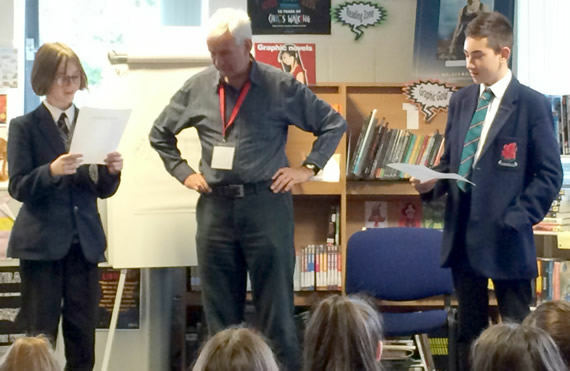 Work with your School Library Service, who could help promote the events in schools.